This model may make an occasional appearence in my Warhammer Army but I have no plans to field a unit of Savage Orks let alone boar boys. At least GW finally made some models for this popular option. Supposedly the Ork and Goblin army list will be revised again, just when I get around to coming up with an army list to use the vast majority of stuff I own already... I've decided since I own piles of Goblins I'll do a Goblin army with some orks. 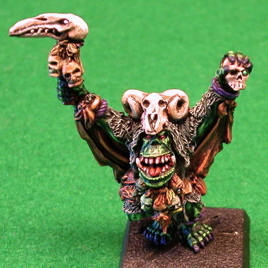 To that end expensive ork units like Boar Boys are not a painting priority, rank and file Goblins are.